The McCarter family, owners of 411 Motor Speedway have leased Volunteer Speedway for the 2017 season. BULLS GAP, Tenn. (Feb. 20, 2017) — The McCarter family (Mitch, wife Tanya, sons Pierce and Mack) have reached agreement with Volunteer Speedway owners Joe and Phyllis Loven to take over operations at “The Gap” in 2017. 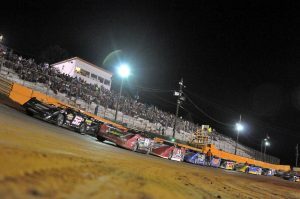 The McCarters, who also own 411 Motor Speedway just outside of Knoxville in Seymour, this season will promote racing at both Volunteer Speedway and 411 Motor Speedway. Both tracks will run the same weekly classes, under the same rules. Volunteer Speedway will open the 2017 racing season on Saturday, March 4 with an afternoon program featuring Steel Head Late Model, Sportsman Late Model, Modified Street and Classic action on the high banks.